"Looking for a mirror in Buckden ?" "
"Mirrororworld have 1000's of mirrors and years of experience delivering mirrors to the whole of the UK including Buckden, We Supply and manufacture mirrors for the home and work place, whether your looking for a simple mirror for your bathroom, a cheval for the bedroom or a statement mirror for the lounge, Mirrorworld are the one stop mirror resource. With 1000's of ready made mirrors to choose from and an award winning made to measure service, it's easy to find that desired mirror here at mirrorworld. Check out our online store or try one of our free quote tools for a perfect custom made to your exact requirements. With a nationwide delivery service you really don't need to look further for a beautiful mirrors at a great prices." "Mirrorworld are the experts when it come to mirrors for Buckden, large or small, framed or unframed, customised and made to measure, we do the lot, whatever your needs look no further. check out our extensive on line catalogue or one of our free online designer tools, we know you'll find the perfect mirror for you. With free delivery anywhere in the UK mainland on orders of £50 your perfect mirror is just a few click away." MU104 Just one of the great selections from our Children Fun Novelty range of mirrors and accessories. Our 'cute' pony mirror is every little girl's dream is perfect for bedrooms and playrooms. Its a magical and fun design and looks so pretty with our children's mirrors Made from high quality 3mm acrylic mirror. All products are supplied with adhesive pads and instructions for use. NOTE: All products have a protective film covering the surface. Please remember to remove the film carefully to reveal the high quality reflective surface. See instructions for use. All prices include VAT Made from high quality 3mm shatterproof acrylic mirror. All products are supplied with adhesive pads and instructions for use. NOTE: All products have a protective film covering the surface. Please remember to remove the film carefully to reveal the high quality reflective surface. See instructions for use. At Mirrorworld we pride our selves in delivering quality mirrors and services throughout the UK, including Buckden. WH025 Just one of the great selections from our Art Deco Rennie Macintosh Styled Leaded Mirror range of mirrors and accessories. 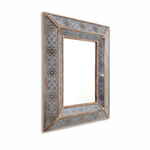 MB004 Just one of the great selections from our Decorative range of mirrors and accessories. Inspired by a combination of Spanish Missionary style, indigenous art, Aztec and Peruvian design. A stand alone piece of ideal to fit with our new Old World styled Collection. The frame of this mirror is also made of glass which creates an eye-catching feature, unexpectedly playful, with surprising light reflections this mirror to work equally well in contemporary and classic spaces. Passionate about our products and service, we want to help you make the perfect choice; so, in addition to holding a wide variety of mirrors in stock, we also offer a number of bespoke services. Perhaps you are looking to whet your artistic appetite or for our professional creative input; MirrorWorld’s accomplished craftsmen will work closely with you to create your own personal design, by hand at our workshop and deliver it to your Buckden home.